How outcome-driven customer research and jobs-to-be-done discovery changed the market opportunity and delivered rapid revenue growth in the enterprise space. 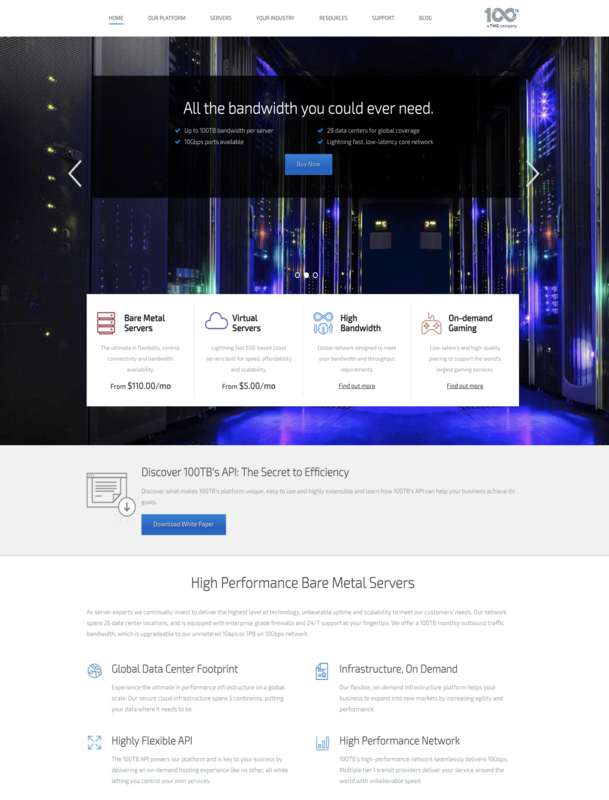 100TB is an infrastructure service provider with a difference. It delivers high-performance infrastructure services with market-leading bandwidth throughput capabilities from five continents and 29 data centre locations. After implementing outcome-driven customer research to understand customers’ jobs-to-be-done, 100TB entered a two-year period of rapid revenue growth. It landed some of the biggest companies in its target audience as customers, and went on to a successful acquisition. 100TB had successfully entered the dedicated server market but was struggling to find a core market focus. We were tasked with taking an end-to-end view of the company’s go-to-market strategy. The company had a number of fast-growing customers, but was facing some resourcing challenges across both sales and technical support. Thus, we needed to find a clear focal point for the business so that it could go-to-market more effectively with a targeted and unique value proposition. We deployed our outcome-driven framework to understand the jobs current customers were trying to get done. We categorised this research into a number of use cases. After conducting outcome-driven segmentation, we discovered two adjacent market opportunities with clear value propositions that we could tackle concurrently: video streaming and multiplayer gaming. It was then a matter of repositioning the brand, aligning the offer model to customer requirements, and building a highly-targeted go-to-market. After initial traction, we built out product capabilities that better served important, unmet customer needs. See how Stratomic can help your business uncover important, under-served customer needs and breakthrough routes to market with our Customer Compass framework.